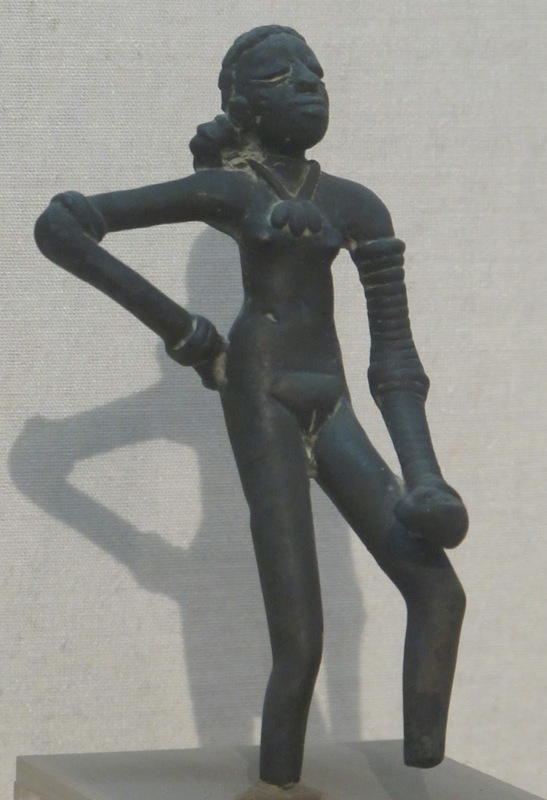 The very famous Bronze Statuette of a 'Dancing Girl ' from earliest civilization of the world Mohenjo-daro is 10.5 centimeters high and is around 4500 years old and was found in the ‘HR area’ of Mohenjo-daro in the year 1926 by Mackey. The girl is in standing position with unusually long hands and is called dancing girl by assuming her profession from the way she stands. She is naked with only necklace and bangles. She has one of her hands on her hip and she is holding something on her other left hand which rests on her thigh. She is wearing 24-25 bangles in her left hand and 4 bangles in her right hand. Dimension: 10.5 c.m. X 5 c.m.